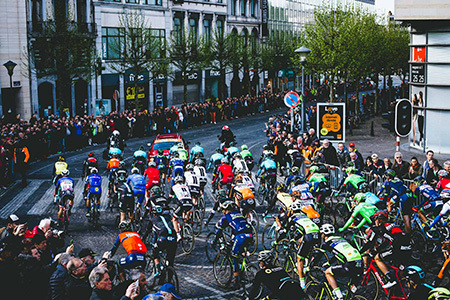 Photographer Chris Lanaway headed to Belgium for the 103rd edition of Liège-Bastogne-Liège. What follows is an account of one cycling fan’s journey to the oldest and arguably the greatest of the Spring Classics - La Doyenne. “Liège-Bastogne-Liège is a race very close to the hearts of many professional riders. 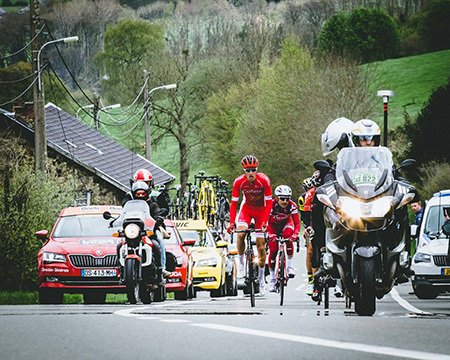 When questioned, those who excel in the hilly Ardennes races speak with great admiration for La Doyenne, citing it as the oldest of the Spring Classics, and one also that allows climbers the opportunity to shine in the early season. Like most bike races in Belgium, the streets are filled with fans from the crack of dawn, awaiting the arrival of the team buses. In Liège, the action centres on the square opposite the Palais des Princes-Evéques. It soon becomes a hive of activity. Riders dash around officials and photographers to sign on for the race, only stopping to provide autographs to fans or to chat to the occasional journalist. Liège-Bastogne-Liège is a race that is known for its unpredictability, possibly one of the few that still hark back to the old days where racing was less formulaic and riders raced on instinct, rather than measured their efforts with readings from power meters. With rain forecast in the run up to the race, riders and fans were pleasantly surprised by a burst of glorious sunshine at the last minute. Following the Classics is known to be problematic. Their very nature – unlike a stage race, there is no tomorrow - means it’s never going to be easy to chase the peloton around the course, as I soon found out. Documenting the start, we soon became stuck among the crowds fleeing the square to head towards the climbs. This was the first hiccup. Finally making it back to the car, we hit the road and made good speed towards what was going to be our first stop. Suddenly traffic ground to a halt: a Jaguar F-Type had caught fire 100 metres in front of us, bursting into flames. The fire brigade and police soon shut the road, and we then became stuck among various media vehicles heading south to intercept the race. About an hour passed until we were back on the road. We found ourselves joining a convoy of media and TV cars, as we decided to head straight to Côte du Saint-Roche, instead of our planned stop. 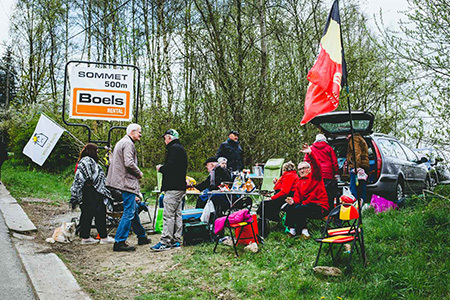 Upon arriving, we were greeted by Belgian cycling fans, and as I got to work capturing some of the atmosphere, we were inundated by offers of wine, beer and food. The caravan soon passed through, until the second incident of the day unfolded: a broken down VIP van, laid on by one of the teams, carrying guests to see the race. The Côte du Saint-Roche is steep - incredibly steep. It’s also rather long, just in case the gradient wasn't enough. Attempting a hill start in a heavily loaded van is not advisable. Soon plumes of smoke billowed out, and the familiar stench of burnt clutch filled the air. Jeers from the crowd soon turned to cheers as the police came to help. With the van unloaded, it carried on up the climb and left the route clear for the riders. Shortly after, the breakaway came past with a hefty gap to the peloton and the fans screamed encouragement as they fought their way up to the summit, which was still nearly a kilometre away. As the fans cleared, we hit the road again, but this was again short lived. Attempting to intercept the race near Spa, we came across roads closed due to road works - another setback. We diverted and found ourselves at the bottom of the gruelling Côte de La Redoute, again greeted by swathes of Belgian fans and a large number of Brits (a shout out here to the Bristol South CC guys). The race was still a considerable distance away and, wanting to throw caution to the wind in order to capture the finish, we drove off and soon found one of the hidden gems of La Doyenne: a small climb near the town of Stoumont, where the race was beginning to splinter as it headed towards the final few climbs, before the drag to the finish in Ans. After a swift dash back to the car, we hit the road again. Successfully making our way to Ans, we managed to find somewhere to dump the car. The town came to life as the race entered the final sectors leading riders to the finish. Alejandro Valverde (Movistar Team) and Dan Martin (Quick-Step Floors) played out their final battle, no doubt spurred on by the noise from the crowds lining the finish straight. Despite valiant efforts from Martin, who left everything on the road, it wasn’t enough to stop Valverde from taking his fourth Liège-Bastogne-Liège title."